After watching Series 1 & 2, I was intrigued enough to give the books a go. 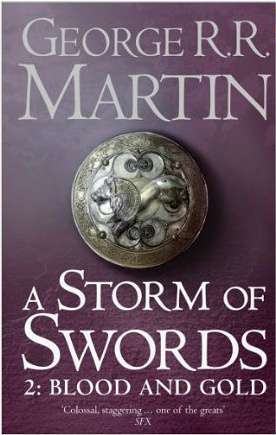 Book 3, ‘A Storm of Swords’ is split into 2 books – see why this requires some sort of commitment?! And because I didn’t know what was going to happen, I zoomed right through both of them, finishing them in about 5 days. 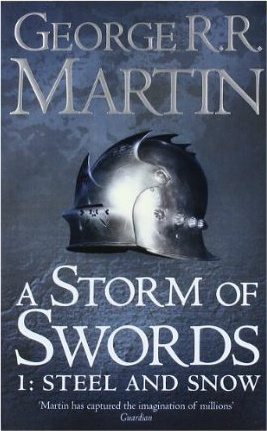 I seemed to have slowed down with Book 4 … Mr Martin doesn’t number his chapters, instead heading each chapter with a different character’s point of view. As a storyteller, Mr Martin borders on being excellent. He really does know how to weave a thoroughly beguiling story, with a cast of (seemingly) hundreds, and he doesn’t lose sight of them. He used the War of the Roses as his inspiration, and the story has the feel of ‘history’ about it, like you’re reading about something that actually happened. I like that each chapter is told from the viewpoint of a different character, and I am amazed at his skill in giving each character a different voice. And his characters include men and women, young children, male and female, mothers, soldiers … each has a different, believable voice. The other thing that leaves me in wonderment is his ability to conjure up names – names for people, names for places … and we’re talking LOTS of names. I struggle like mad to come up with even a handful of names. He’s also a brave storyteller – he does not flinch from killing his characters. And the ones he has killed (so far) have left me bug-eyed and slack-jawed! He’s also not afraid of putting them through the wringer, and not just once either. I am enjoying the books … so far … There’s still another 3 to go, with Book 5 split into 2, and I don’t think he’s finished the final one yet. 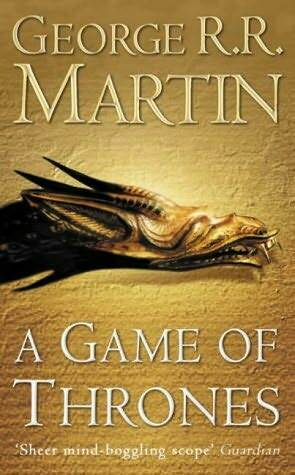 I sincerely hope he DOES finish his story, as promised, in Book 7, and it doesn’t morph into one of those tedious, never-ending sagas.